Mediterranean Trees Shipped to your door. Please note: The cost for deliveries of trees exceeding 2m in height will be by 'special arrangement only', due to the restrictions applied by the courier network. Please feel free to call us to discuss your requirements. We will be happy to 'quote' and propose the most efficient means of delivering your order. 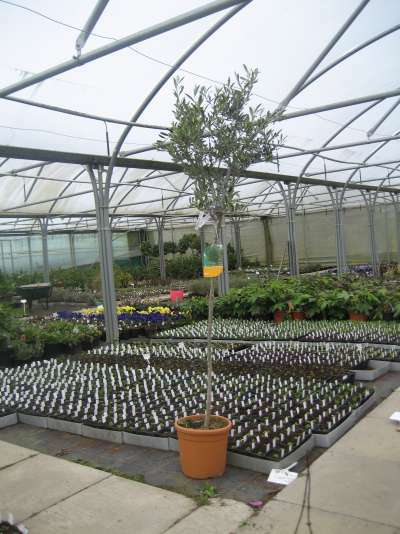 Any delivery charges already quoted against 'large trees' on our website are for guidance only and are dependent on the specific height of individual specimens. If you have a protected city garden or live in a mild area, Olives can be grown outdoors as long as you give them a sunny position and plant them in well-drained soil.....against a warm wall would be ideal. In cold or Northern regions, Winter protection in a conservatory for example will be required. Once established they are extremely drought-tolerant, but plants will do better if watered regularly in dry spells during the growing seasons. It's a good idea to feed each Spring with a general fertiliser, such as Vitax Q4. Olives naturally shed their older leaves in Spring (April in UK) as new growth begins. 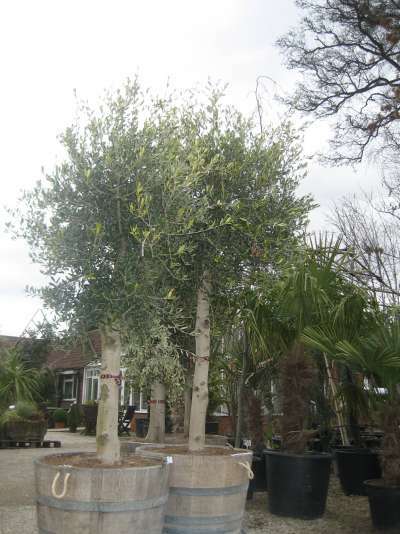 Olives are not entirely hardy in the UK and will be damaged by temperatures below -10c (14f), so in colder areas of the country you can grow Olives in large (60cm/24") diameter and depth containers. Plant in a well-drained mix of compost, such as loam-based John Innes No 3 with 20 percent by volume Horticultural Grit. You can place containers outdoors in Summer then into a cold conservatory, porch or greenhouse over Winter. Olives grow very slowly, so don't require much pruning at all. If needed, in late Spring or early Summer, remove dead, diseased or dying branches. At the same time, thin out branches to allow light into the centre of the tree and remove any branches that spoil the shape. Avoid pruning too hard as this will result in the over-production of non-fruiting water shoots. Container-grown plants may need additional Summer pruning to keep their size in check. When plants in containers get to about 1.5m (5ft), pinch out the tips to encourage branching. In order to initiate flowers and fruit, Olive trees need a two-month period of cold weather (with temperatures below 10c (50f)). They also need a fluctuation between day and night time temperatures. Plants kept indoors are therefore unlikely to flower. Very dry soil conditions can also inhibit flowering, even if the tree is able to tolerate such conditions. Watering during dry spells between February and May is therefore crucial for fruit production. Prolonged cold weather (below 7.5c/45f) can also inhibit fruit production. Growing more than one cultivar will increase cross-pollination and improve yield, although even a single tree should produce some fruit.....Olives being 'self-fertile'. Fruit is produced at the tips of the previous years growth, so excessive pruning will also prevent fruiting. Thinning of the crop is recommended, reducing the fruit numbers to 3 or 4 per 30cm (1ft) of branch within three weeks of flowering, in order to ensure that the crop will ripen and not drop prematurely. Ripe black Olives can be picked and eaten raw, but taste quite different from commercially sold Olives, which are usually picked unripe and green, or black and ripe, but are then cured to produce an edible product. 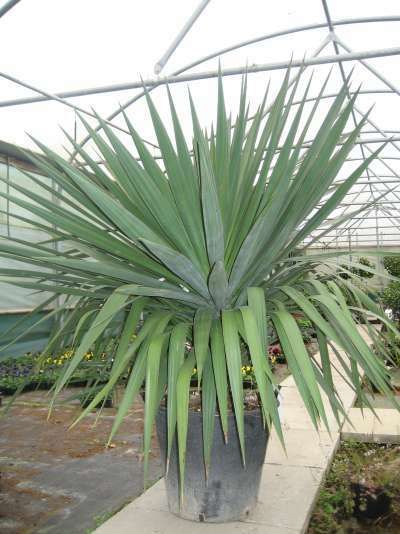 Brahea armata has one of the bluest colours of any palm. This is due to a shiny, waxy covering to the leaves. It can tolerate freezes down to about -10C (possible lower for short spells) as long as it is kept in very well-drained soil. 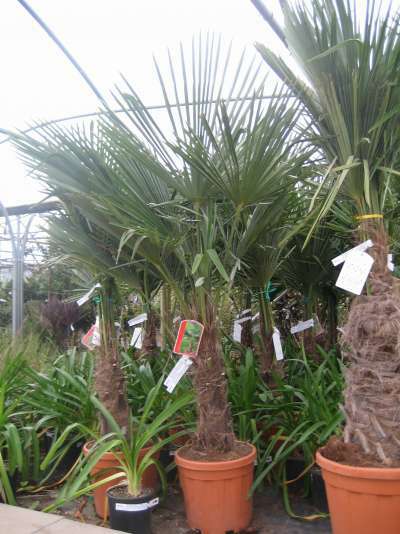 A stunning palm that produces whorls of stiff green leaves that live for several years. Slow growing ideal for the patio in Summer and into the conservatory in Winter. Olive in half Oak barrel (barrel diameter 70cm, height 46cm, 2 rope handles). 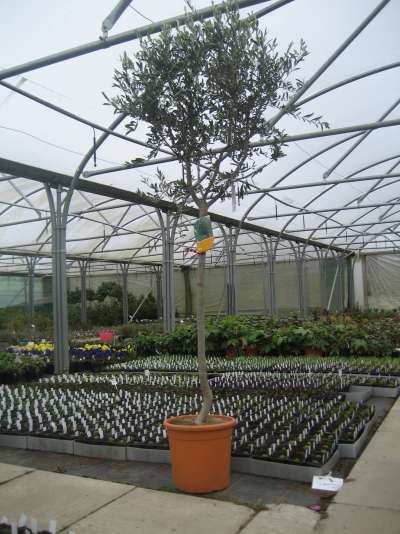 Olive tree height, from soil is 'from' 1.8m. An evergreen, rounded tree with grey/green leathery leaves and tiny fragrant creamy white flowers followed by edible green fruit, ripening to black. Clip to required size. Flowers from June to August. Olive. An evergreen rounded tree with grey-green leathery leaves and tiny fragrant creamy white flowers followed by edible green fruits ripening to black. Clip to required size. Flowers from June to August. . Fruits from August Evergreen. Great plant for hot sunny sheltered courtyards or indoors in a conservatory. Olive. An evergreen rounded tree with grey-green leathery leaves and tiny fragrant creamy white flowers followed by edible green fruits ripening to black. Clip to required size. Flowers from June to August. Fruits from August Evergreen. Great plant for hot sunny sheltered courtyards or indoors in a conservatory. Olive. An evergreen rounded tree with grey-green leathery leaves and tiny fragrant. creamy white flowers followed by edible green fruits ripening to black. Clip to required size. Flowers from June to August. . Fruits from August Evergreen. Great plant for hot sunny sheltered courtyards or indoors in a conservatory. 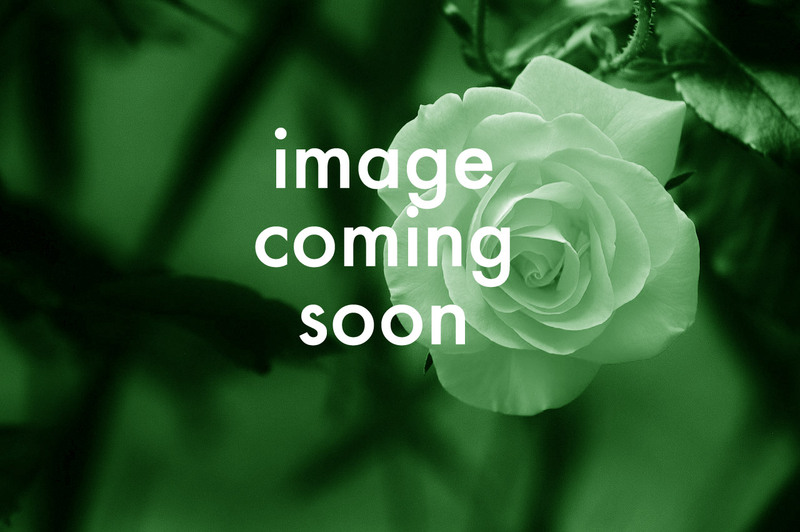 CURRENTLY UNAVAILABLE TO ORDER Chusan Palm. 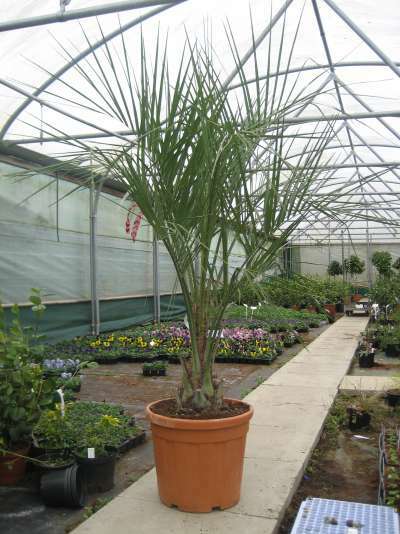 A double stemmed palm with large fan-shaped dark green leaves. Small yellow flowers emerge close to the leaf bases in early Summer. The hardiest palm in Britain. Height 20m. Spread 2.5m. Flowers from June Evergreen. Frost hardy. Shelter from cold drying winds. Slow growing in the UK. Spanish Dagger. An upright shrub with rigid pointed blue-green leaves maturing to dark green. Upright spikes of bell-shaped white flowers in Summer and Autumn. Flowers from June to October. Evergreen. Frost hardy.